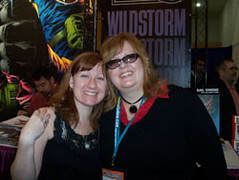 A pair of Superman redheads come in #14 on my favorite comic redhead list. Please delurk if you have any comments on the list! In the original Superboy stories, Lana was the girl who lived next door to the Kent family in Smallville, and was a romantic interest of Superboy. Lana was a childhood friend of Clark, with a certain degree of romantic tension in the air as Lana had long pined after Clark who had loved her only platonically in return. 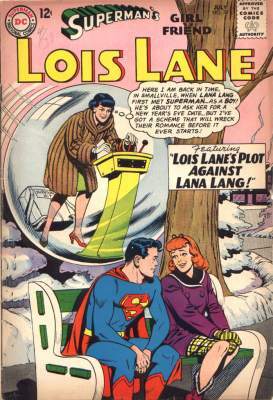 It was sad that Lana was reduced to the also-ran who not only lost out to Lois, but never even had Clark's affection to begin with. In the 1983 movie Superman III Lana was played by Annette O'Toole (who went on to play Martha Kent in the TV series Smallville). The Smallville Lana is a Chinese/Dutch brunette, rather than the traditional redhead. While she is a beautiful actress, the distinct red hair of the character is gone. In 2006's Superman Returns, Jimmy is played by actor Sam Huntington. Again, his traditional red hair was changed to a brunette character. To me, the red hair is so intrinsic if you know these characters, but I guess the casual movie or TV viewer doesn't know the origin. Two Nuns are riding their bicycles down the back streets of Rome. One leans over to the other and says, "I've never come this way before." The other nun, a redhead, whispers, "It's the cobblestones." Your little joke made me chuckle...and made me want to go bike riding in Philly. Haha! I will wait and see if my favorite character from comics makes an appearance. Then I might even leave a lengthy comment then. Until then, being unusually partial to redheads, I think I will just sit back and enjoy the countdown. As a redophile, I am enjoying the countdown too. I could write thousands of words about my love for the Silver Age Lana Lang. Don't be misled by later revisions in name only -- in the best Superboy stories Lana is distinguished by her intelligence and all-around coolness. Whereas Lois always came across as trying to trap Superman, the original Lana really genuinely liked and cared for Clark Kent as himself. I always apply a "fairy tale" rule to Clark and Lois and Lana. Let's say this was a fairy tale about a prince in disguise as a commoner, trying to choose between two fair maidens. One maiden treats the commoner like dirt beneath her notice, and dreams only of the day when the glamorous prince will come along and sweep her off her feet. The other maiden cares nothing for the prince, but treats the lowly commoner kindly and with affection. In that fairy tale, which maiden wins the prince? Lana, of course! And remember...she's also Insect Queen, and wins a place of honor in my heart as the kind of gal who thinks bugs and insects are cool, not icky or creepy. Justin- I could have made the list 3x as long, so we'll see if your favorite made the small cut of only 15. If not, please let us know who it is! Rab, a perfect summary for Lana. A lot of early stories seemed to just pit her against her 'rival' Lois. Smart, decent, and cool- Lana wins! When I was a kid, I never really warmed to the boring-to-me Boring/Swan/Plastino etc. Superman stories...but I always liked reading Jimmy Olsen comics, especially those great 80 page giants that had more concentrated insanity than should have been legal. Lana returns to Metropolis more-or-less for good roundabout Superman #317 (1977) and becomes a rival for Superman's affections. Lana and Lois play lots of dirty tricks on one another, completely unbecoming of prize-winning journalists, as they compete not only for Big Blue but for stories. In this period she's portrayed as a flighty, even-less-mature Lois, and Superman gives her a good telling-off (and letting-down) in #332, which even my preteen self thought was unduly harsh. Later writers matured the character and gave her a super-squeeze of her own in the alien Champion Vartox (they met in Action #498, if memory serves). Sadly Vartox had off-world responsibilities and only popped up every couple of years or so, and usually then to fight Superman under coercion or mind-control. In Superman #373-375, she finally decided to move off of Earth for him, but ended up not being able to (it had something to do with Vartox's ex). Subsequently, a much less annoying Lana did take an interest in Clark who, as Superman, had it out with Vartox in Superman #390-392. (Once again, our alien friend was not in his right mind.) That's about where I stopped reading the title (before the great Byrne reboot) so I don't know just how far the writers took it. But yeah, I always liked Lana better too. Thanks ramessesix for that great pre-Byrne rundown. The 1970's pitting of Lois v. Lana is desperate. I'll have to see #332-- glad to see that you liked Lana too.